Please note that the content of this book primarily consists of articles available from Wikipedia or other free sources online. 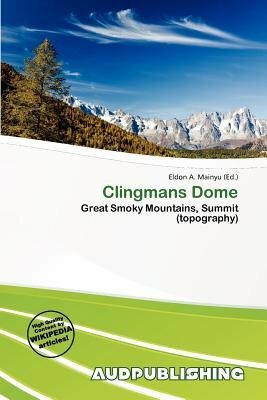 Clingmans Dome (or Clingman's Dome) is a mountain in the Great Smoky Mountains of Tennessee and North Carolina, in the southeastern United States. At an elevation of 6,643 feet (2,025 m), it is the highest mountain in the Smokies, the highest point in the state of Tennessee, and the highest point along the 2,174-mile (3,499 km) Appalachian Trail. East of the Mississippi River, only Mount Mitchell (6,684 feet / 2,037 metres) and Mount Craig (6,647 feet / 2,026 metres) are higher.